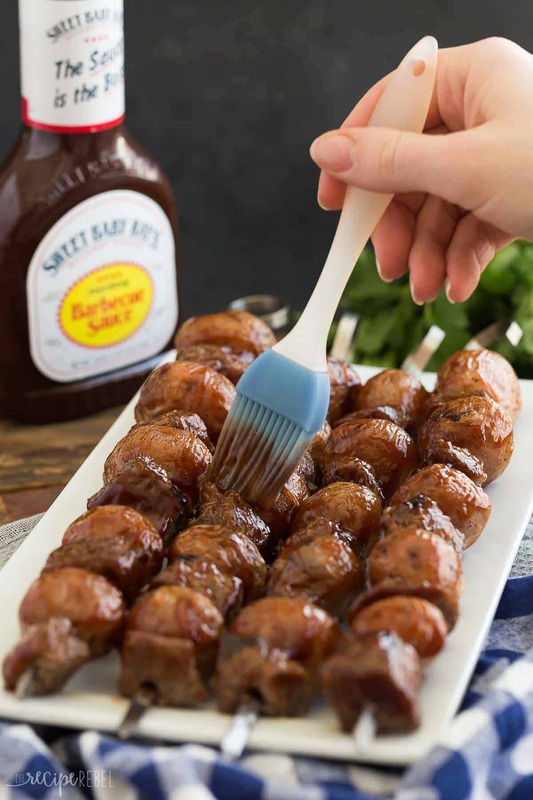 These BBQ Steak and Potatoes Skewers are a quick, weeknight meal for the grill! The microwave makes these steak kabobs come together even quicker, and the homemade spice rub and barbecue sauce gives them so much incredible flavour! We spend a lot of time grilling in the summer, but we don’t often have steak. It’s one of those somewhat rare, but extra special treats that we bust out for special occasions (hint, hint — Mother’s Day, Father’s Day, Memorial Day, Canada Day and the 4th of July — they’re all coming up before we know it!). To cut down on prep time for this recipe — because I know you don’t want to leave your beach blanket or lawn chair any sooner than you have to! — we’re using a great cut of steak that doesn’t require any marinade. It’s still going to be incredibly tender, and the entire meal comes together in under 30 minutes easily. The flavour on these steak kabobs, you guys — it’s unreal. First, a super simple homemade spice rub to season up that glorious striploin steak. Throw it on the grill and then smother it in that thick, rich, Sweet Baby Ray’s Original Barbecue Sauce. It’s smokey, and sweet, and savoury, with just a hint of spice, and it is such an easy way to take your summer grilling to the next level. We put this stuff on everything — from chicken to pork to grilled veggies or to jazz up a pot of chili, we love how it makes any meal over-the-top delicious! Because the potatoes require more cook time on the grill than the steak (and nobody wants overcooked steak! ), we’re giving them a head start in the microwave. They’re still going to be just as creamy and delicious as ever and everything will finish up on the grill right on time for dinner. I recommend striploin steak for this recipe, as it is easy to cook, tender, and flavourful — stock up when it’s on sale and freeze it for future meals! 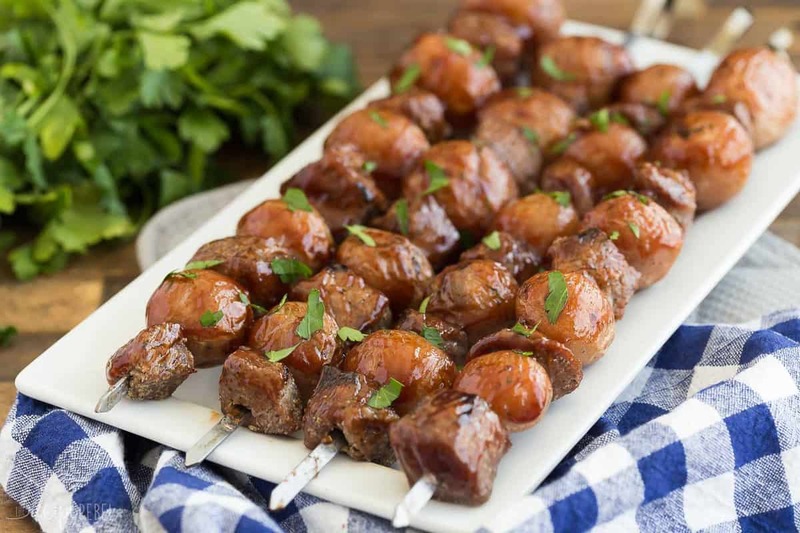 These skewers are easy to prep ahead! You can leave the steak in the bag with the spice rub in the fridge for up to 24 hours (or freeze for 3-6 months! ), and you can prep your steak and potato skewers a few hours before you plan to grill them. Simply cover and refrigerate until your guests arrive. Feel free to add even more veggies on here: mushrooms, peppers or zucchini would be great, too! Or throw some corn on the cob on the grill with your skewers for a full meal deal. *This post is generously sponsored by Sweet Baby Ray’s — thank you for supporting the brands that support us! See this recipe and more on the Sweet Baby Ray’s web site! Preheat the grill to medium-high, or about 400 degrees F.
Using a skewer (I liked to use the stainless steel ones! ), pierce each potato through the center. Place potatoes in a single layer on a microwave-safe plate. Cook on high for 4 minutes, until somewhat tender (they should give some when you press them!). Remove potatoes from the microwave and toss with canola oil, salt and pepper. Meanwhile, In a large Ziploc bag, combine brown sugar, garlic powder, onion powder, paprika, black pepper and salt. Add steak cubes, seal, and massage the steak until the seasoning is evenly distributed. 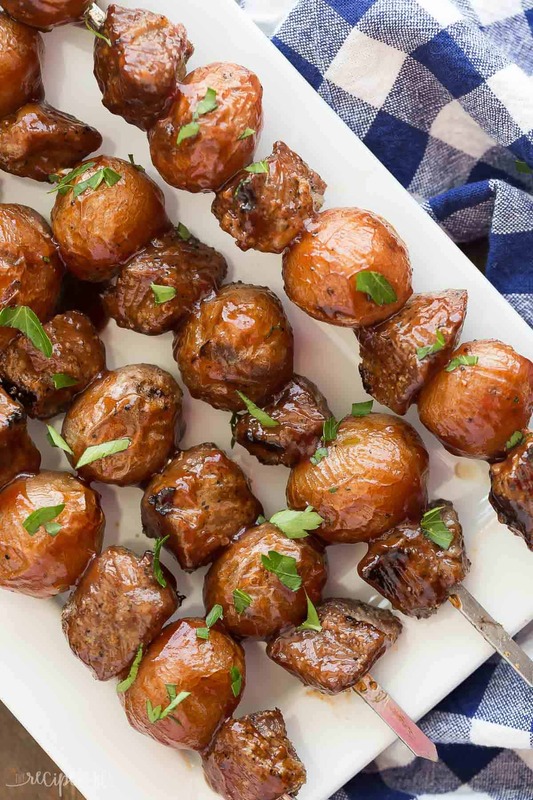 When the potatoes are cool enough to handle, make your skewers, alternating potatoes and steak cubes. Place on the grill, and cook for 5 minutes. Flip, brush with barbecue sauce, and cook an additional 5 minutes or until steak reaches desired doneness (always check with a meat thermometer – 155 degrees F for medium, 165 degrees for well done). Serve immediately. I can’t WAIT for grilling season! These skewers look amazing! My boyfriend would be super excited too if he came home to me making these! Perfect man food LOL! I had to google strip loin because I’d never heard of that cut before (but really I had I just didn’t know it). That sauce sound to die for! I think it’s maybe called a strip steak or something different in the U.S., but it’s so good and so tender!